“The third ABG will increase the speed of transfer. Priority areas include: land; environment; mining health and safety; fisheries; incorporation of associations; police; and the ABG’s foreign affairs powers – proposing names on the PNG visa warning list, work permit applications for Bougainville, and so on. With autonomy, significant new powers were fully transferred through development of many new laws passed, including physical planning, Public Finance Management, Mining, and a separate Bougainville Public Service. How did the ABG perform in relation to these matters between 2010 and 2015? an unwavering commitment to the course we intend to follow.On behalf of all the newly elected members of the third ABG, I commit all of us to work on behalf of all Bougainvilleans to ensure that our common dreams and aspirations are achieved. 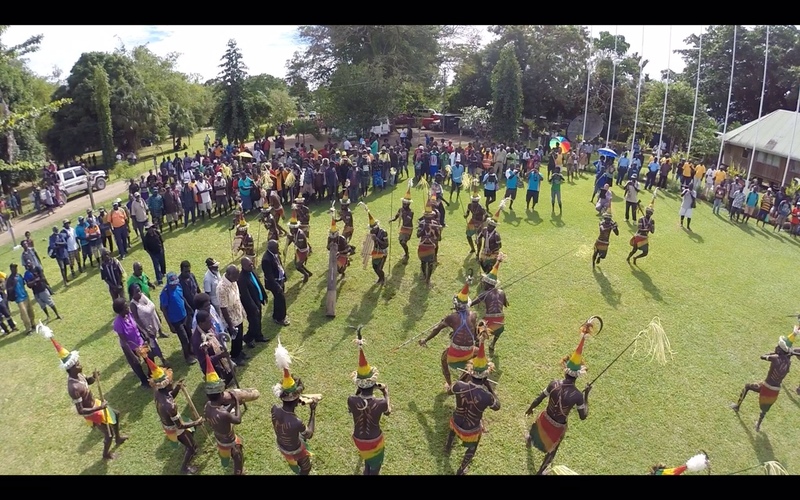 Thank you all for joining me in marking this beginning of what I believe will be the most exciting, but also challenging, five years in the history of Bougainville. The ABG President, Chief DR.John Momis yesterday said Panguna may never Open although Bougainville’s financial woes can be resolved immediately if it opens. Speaking at the Inauguration ceremony, DR. MOMIS said that under the Bougainville’s law on Mining, the landowners have the power to decide what’s on their land and no one can push them around. President Momis said that options are if the landowners want or if BCL wants to re-invest in Panguna it’s up to them to decide as the ABG can just facilitate the process. He said that if PANGUNA is allowed to open it can take up to seven years for reconstruction to commence before actually getting Copper ore from the ground. For a complete new mine it would take over fifteen years for exploration to take place and to get the first ore from the ground. He said some options are already available for the Government to consider if PANGUNA does not open. Fellow Bougainvilleans, and Guests from elsewhere in PNG and from other parts of the world: I welcome you all to the Inauguration of the Autonomous Bougainville Government’s 3rd House of Representatives. There are 2 major reasons why this day, 15 June 2015, is important to all Bougainvilleans. First, it marks 10 years since we began our journey to self-determination under the Bougainville Peace Agreement. Second this day starts the 5 year period during which we are guaranteed the right to participate in a referendum on our independence. The Bougainville Peace Agreement is the real basis for us all being here today. It provides us with an exclusive right to self-determination. We can choose and shape our future, a right unique in PNG, and rare internationally. We should celebrate this right, as we do by being here today. We also celebrate and are grateful for the support we receive from our many partners, especially the two most important, PNG and Australia. 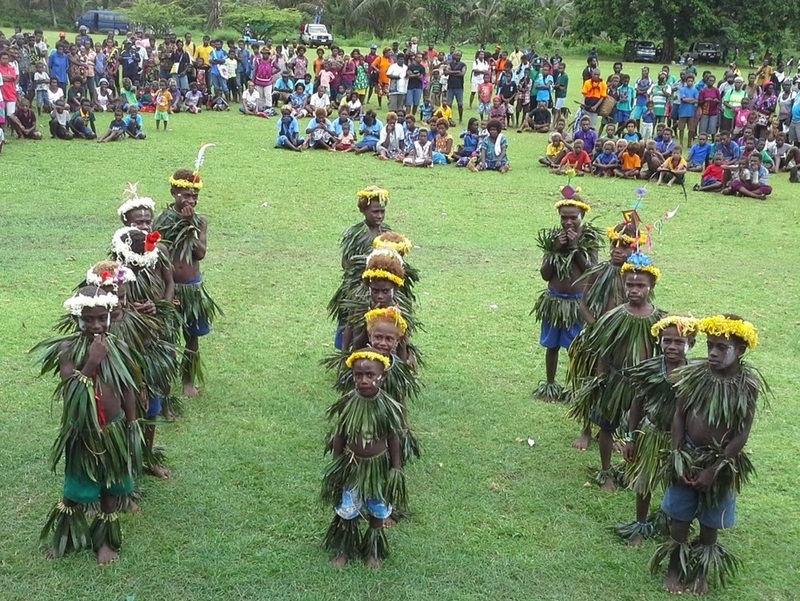 We rely mainly on PNG grants and donor funding – especially that from Australia. Ladies and Gentlemen, I must acknowledge the vital contributions of those that have helped us to achieve the things that have got us here today. First, I congratulate the people of Bougainville, for participating actively and peacefully in the process to select Bougainville’s leaders. Next I acknowledge those who led the peace process. Some are no longer with us. But their contributions are not forgotten. The first ABG Presidents provided the solid foundations for the ABG. I acknowledge the presence here today of not only Rose Kabui, widow of the 1st President, the late Joseph Kabui, but also the 2nd President, James Tanis. I thank members of the 2nd House for their contributions to Bougainville, from 2010 to 2015. The 3rd House will be standing on their shoulders. I thank the Bougainville Electoral Commission, the electoral officials, their advisers, and the donors, whose efforts delivered the general elections. To the other 8 presidential candidates, I offer my congratulations. You contributed to debate about how to meet the needs of Bougainvilleans. Presidential candidates were invited today. I aim to work closely with them. I also thank all the candidates in other seats, as well as their committees, scrutineers, and supporters. Voters had real choices of leadership and policies. I acknowledge the presence of senior National Government representatives. In the absence of the Prime Minister (who is overseas) acting Prime Minister Hon. Leo Dion is with us. 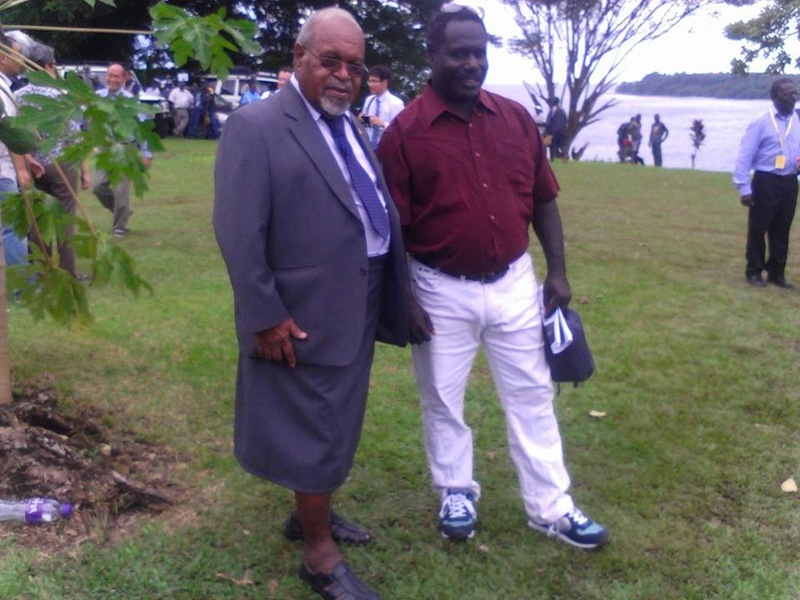 Others include Governor of East Sepik, Hon. Sir Michael Somare; Minister for Foreign Affairs, Hon. Mr. Rimbink Pato; and Minister for State Enterprises, Hon. Ben Micah. 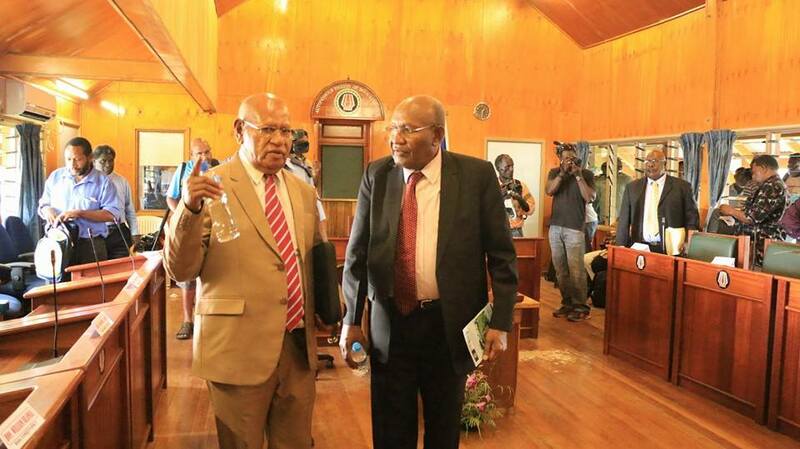 The Peace Agreement was a joint creation with PNG, and ongoing partnership is needed for it to bear fruit. I acknowledge the Chief Justice. All ABG members deeply appreciate the recognition of the ABG by the participation of PNG’s highest judicial officer. Finally, I acknowledge the presence of international community partner representatives – the UN, Solomon Islands, Australia, New Zealand, China and the United States of America, whose support is of critical importance to us. I turn now to consider the work of the ABG. On this same date in 2010, I outlined five major tasks then facing the newly elected 2nd ABG. I want to share here my honest assessment of both successes and failures of the ABG in its efforts to carry out those tasks in the last 5 years, and indicate priorities (some of them new) in what the 3rd ABG will do. Progress towards ending the Morgan Junction roadblock. 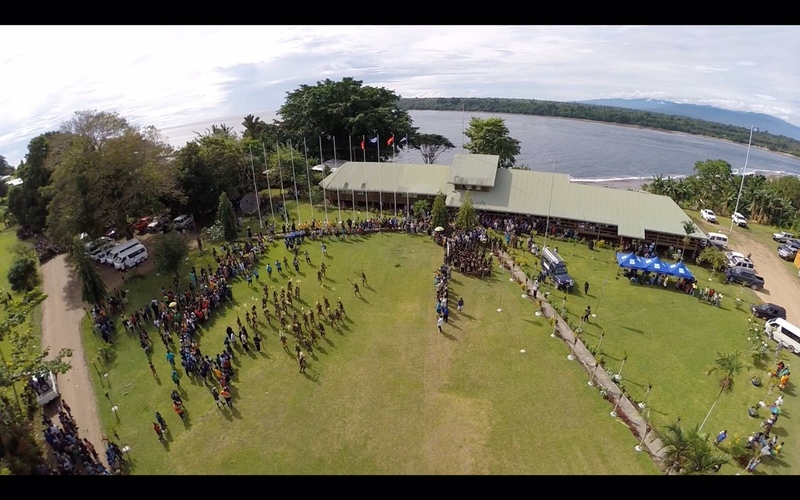 But although Bougainville is more unified than in 2010, much still needs to be done. Unification continues to be essential as we prepare for the referendum. The ABG’s 2nd task was improving the welfare of all Bougainvilleans, by promoting appropriate economic development. There’s been progress. Cocoa production is better than expected when the cocoa pod borer arrived. Small-scale gold production has increased. The ABG has 2 new ships. A partnership with a Chinese consortium is doing metal fabrication at Toniva, producing bricks and aggregate using Jaba tailings material, opening a wholesale store in Buka, and creating over 100 jobs. The K300 million in National Government SIF funds since 2011 has contributed infrastructure, contracts and jobs. Our POGE partnership delivers basic goods at lower prices, starting with rice.We need more broad-based development to bring improvements in people’s lives. We face obstacles. Attracting credible investors is hard due to the risks of our post-conflict situation, made worse by ongoing law and order problems.Another factor is limited ABG funds. Because of PNG’s fiscal crisis when negotiating the Peace Agreement, the main National Government grants cover only basic costs of delivering services. We have little internal revenue. The Agreement does provide a Restoration and Development grant, with a formula intended to increase when National budget development expenditure rises.With rising commodity prices, PNG development expenditure increased rapidly from 2005-06. The grant should now be over K75 million a year, but we’ve got only K15 million most years. Arrears are now well over K400 million. The National Government SIF funds since 2011 are helpful. But as conditional grants, they are no substitute for the Restoration and Development Grant. Producing house bricks, as is already happening using Jaba River tailings. The radical new Bougainville Mining Act means any new mining will be on totally different terms from under the Bougainville Copper Agreement. The biggest protection is that no development will be possible unless both landowners and the ABG are satisfied with all the conditions for mining. It is certainly possible Panguna will not re-open, if landowners oppose it, or if BCL don’t return and alternative developers can’t be found. But other communities want mining exploration and those possibilities will be evaluated. Under our March 2015 Bougainville Mining Act, customary land owners also own minerals. They can reject mining exploration and development. So Panguna will not re-open without landowner agreement. That means clear agreement by a clear majority of landowners, with no manipulation of consent. Our only realistic option for rapid fiscal self reliance and improved levels of services is large-scale mining. Re-opening the Panguna mine would provide the best chance of early revenue, as it could open in 6 or 7 years. Alternative new mining projects would take from 15 to 30 years from exploration to production. The referendum timetable places pressure on us to achieve fiscal self reliance rapidly. Our annual budget is over K300 million, but internally derived revenue is only about K30 million. Gradual economic expansion will not deliver self-reliance (covering costs of current services) as well as providing the much improved levels of services Bougainvilleans both expect and deserve. Cheap and reliable power will be vital for such projects, as well as for improving the lives of people by village electrification. So the 3rd ABG will work towards a hydro-electric grid. Two hydro projects are already in progress, one at Togerau, and one on the Ramazon River, funded by the ADB. Our Chinese joint venture plans one at Toniva. These projects must progress as soon as possible. I will discuss support for the Togerau project with its main organiser, Sam Akoitai. I will seek funding for a scoping study for developing the hydro-electric grid. Promoting these and similar activities will be a key priority of a new Ministry of Economic Development that my Government will establish. Several options have been discussed for setting the date. Although I’ve suggested considering 2019, I’m open to all possibilities. I will consult widely on the issue, with both the new ABG and the Bougainville community.I have strong views on the process to be used to set the referendum date. The Peace Agreement clearly states that maximum period for delay of the referendum is 15 years after the ABG is established, which is mid-2020. That maximum delay cannot be extended except on a decision by the ABG. Weapons and governance can be considered when deciding the date between 2015 and 2020, but they cannot be used to delay the referendum beyond 2020. Suggestions at the National level that the referendum could be delayed beyond 2020 on the grounds of weapons or governance are a matter of grave concern for the ABG. Any such attempt would breach the Peace Agreement. However, I remain optimistic that good sense will prevail, and that the clear meaning of the Peace Agreement and the PNG Constitution will be honoured. MY FRIENDS, THERE IS MUCH MORE THAT COULD BE SAID. BUT I HOPE THAT YOU HAVE ALREADY GAINED A SENSE OF THE CHALLENGES THAT FACE US IN BOUGAINVILLE. At the same time I must point to the need for more coordinated planning of the use of fiscal resources of the ABG, the National Government, the donors, and the Bougainville MPs. Limited coordination causes confused objectives, overlap, and even waste. I propose developing a new mechanism for consulting the National Government, MPs and donors so as to agree both development goals under a rolling plan, and what aspects of the plan each will fund. There could be considerable pressure on the new ABG to be very restrained in our spending. We will face the major challenge of trying to achieve more while using less funds. I ask all ABG members as well as all other Bougainvilleans to understand these financial difficulties that we face. The financial resources available to us will of course have a huge impact on what the 3rd ABG can achieve. And although what I have just outlined might suggest that the ABG has plenty of funds available, the truth is otherwise. That’s not only because of the limited funds guaranteed by the Peace Agreement, but also because of the current fiscal problems of the National Government. Those problems are mainly caused by falling natural resource prices. As a result 2015 SIF funds for the ABG expected from Port Moresby may be under threat. We will explore partnerships with high quality hospitals in other countries. We must aim high, towards our own university, high quality technical colleges, a computer literate population. During the next five years, I will be seeking a massive expansion in Technical and Vocational Education and Training, beginning with development of at least one high quality Technical School. Development also depends on our population being both healthy and well-educated. So our development plans must seek the highest possible health standards and the best education facilities in the Pacific. Economic opportunities and good education are also critically important to law and order. For example, semi-educated young men with no employment or business opportunities have been a major factor in our ongoing law and order problems since the early 1980s. So we must pursue real improvements in health and education, and basic infrastructure too. Economic opportunities, good health and good education all go together. They contribute to our economic development. That then generates the tax revenue needed for fiscal self-reliance. The ABG also has a sixth major task – to improve basic services. Since the late 1990 we have made progress in restoring health and education services destroyed during the conflict. But service standards are worse than before the conflict. The ABG must solve the problems faced by our people. Our other efforts mean little if the basic condition of people’s lives don’t improve. Awareness will need to be a major priority as the referendum approaches. So we will explore options for cost-effective and widely accessed awareness methods. In the process we learned about the practical difficulties and high expense of conducting awareness and consultation campaigns. The basic truth is that with unlimited funds and personnel, we could do far more. But funds are limited. The fifth ABG task is public awareness. The 2nd ABG put much effort into awareness and consultation on mining policies, both Panguna, and the Bougainville Mining Act. With awareness of the Peace Agreement, there was much training of staff, but little awareness was actually conducted. Under the 2nd ABG proposals for reform of the Council of Elders, COEs will be re-named as ‘Community Governments’. Together with custom-based village assemblies, they will have more responsibility for law and order, working more closely with police, administering small-scale mining licences and so on. Bougainville’s the rule of law situation is generally better than many other parts of PNG. But much more is needed. We need progress on weapons. Our Police Service needs to be more respected and integrated into rural communities, and responsive to local leadership. In terms of corruption I fear we’ve made little progress. The situation MUST change under the new House. So reform of the Public Service will continue. I will resume efforts to establish an office of the PNG Ombudsman to work with us to establish the highest standards of conduct for leaders and Public Servants. The fourth task for the ABG is promoting good governance and the rule of law, and ending corruption. In terms of good governance, in general, the processes of the ABG were strengthened, and worked well in the last 5 years. But good governance involves much more than that. So clearly weapons disposal must be a major priority for the 3rd ABG. So I propose holding a summit of former combatant leaders, including Me’ekamui groups, as well as other sectors of the community, to consider the ways ahead. Fourth, international community support may be required to encourage implementation of the referendum outcome. We must make sure weapons disposal issues do not undermine international community support. Third, the National Parliament has the final decision on the outcome of the referendum, and could use weapons issues to decide against independence. Second, weapons availability could result in referendum observers determining the referendum is not “free and fair”, as required by the Peace Agreement. First, disagreement between the governments on weapons could push the date back towards mid-2020. Without much more complete weapons disposal our law and order situation will only get worse, and we risk major problems over implementation of the referendum result. There are four main issues here. On preparing for the referendum, the 2nd ABG achieved some progress by proposing establishment of a joint government working group, which reported to the JSB. But the real preparatory work begins now, with the election of the 3rd ABG. Key issues remain to be negotiated, including the referendum date, and the question to be asked in the referendum. With these and other serious problem areas, the key leaders and officers involved are often not aware what the Agreement requires. So the ABG will seek a better understanding so that the Agreement is implemented in full. Other aspects of the autonomy arrangements have not been fully implemented. The Restoration and Development Grant arrears is one example. Another is failure to appoint the ABG choice of head of the Police in Bougainville (the Agreement requires appointment of the ABG nominee as ACP – something that the Police Commissioner has not ever done). I will seek the earliest possible National Government agreement on an agreed approach to timely negotiation of the necessary funding to accompany every transferred power. The key issue is not just transfer. The ABG must also get PNG agreement to funds in the main Recurrent Grant for salaries and operational costs for transferred powers. Without such funds, we have no capacity to use newly transferred powers. Subject to negotiations between the governments, the Peace Agreement guarantees this funding for any newly transferred power. The 3rd ABG will increase the speed of transfer. Priority areas include: land; environment; mining health and safety; fisheries; incorporation of associations; police; and the ABG’s foreign affairs powers – proposing names on the PNG visa warning list, work permit applications for Bougainville, and so on. an unwavering commitment to the course we intend to follow.On behalf of all the newly elected members of the 3rd ABG, I commit all of us to work on behalf of all Bougainvilleans to ensure that our common dreams and aspirations are achieved.